GogTasks v6 and newer gives you a fine-grained control over which folders you want to synchronize. This article assumes you are using Folder mode, but it also applies with some limitation to Category mode. The Governing-tab of the preferences gives you the option to synchronize in only one direction. Note this setting will always trump the filtering settings you may apply in the Fitering tab. Both ways is the default option. In this mode, changes done in Outlook and Google will be synchronized to each other, and in case of conflicts, the most recent change win. The workings are similar for Outlook to Google, but in the opposite direction. While the Governing-tab allows you to change the sync behaviour on a general level, the filtering tab allow you to set behaviour on list level. The most common use case will probably to filter out some lists that are work-related or contain sensitive information from synchronizing with Google. 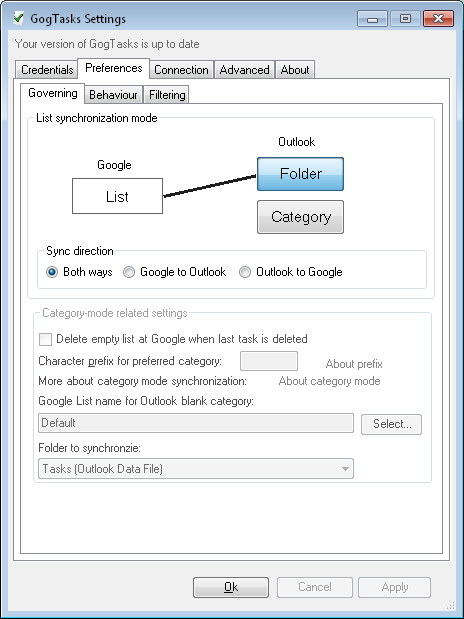 Still the filtering settings can also be configured so as to give single lists one-way sync behaviour while other sync both ways. In these examples I assume you have configured Both ways synchronization in the Governing tab. I will only go into details on the List filtering. For info on Mail sync options which also are available on this tab, see the Synchronizing the Todo-bar article. 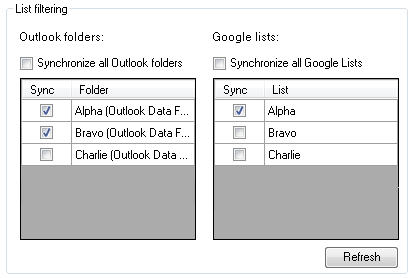 The List filtering box is split in two, with the Outlook folders to the left and the Google lists to the right. You may at any poing click Refresh to reload the list of lists from Google. Above both lists you will find a check box which disables filtering, as in all lists are synced. This option is checked by default. To enable fine-grained list filtering, remove this check mark. Here list Alpha is synced two-way, list Bravo is only synced to Google while list Charlie is ignored on both ends. For lists that only exists on one platform (not yet synced), It will by default be synchronized two-way if it is checked for that platform.